Who Sells Organic Dog Food Online? Taking care of your furry friend shouldn’t be difficult. Make sure they receive plenty of love and attention, take them into the vet regularly, get them out to socialize and exercise and feed them nutritious food. The food part however can prove far more challenging than it should. Big brand pet food providers often offer inferior food with an assortment of fillers and unhealthy byproducts. What should you do? Organic dog food ensures your pet receives healthy, wholesome food, free of steroids and chemicals found in many other non-organic products. If you don’t live near a specialty pet store, you can buy organic food online. Ben’s Barketplace is here to help connect you with the very best organic dog food around while keeping your dog happy and healthy. 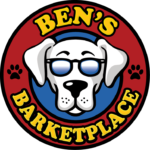 Ben’s Barketplace selects only the highest quality products for your pet. After all, the single largest contribution to your pet’s health is the food you feed them. Whether you’re looking for organic food or treats, you’ll find it all at Ben’s Barketplace. Our selection includes raw, freeze dried raw, kibble and canned dog food. We offer free weekday delivery in the greater Roseville, CA area for purchases of $50 or more. Save yourself a trip and schedule regular deliveries to make sure you never run out of the chow that keeps your dog healthy and energetic!